Most bands tend to be influenced by another artist to forge a new sound or style. It’s either a blatant rip-off or just a skimming of the best traits to take advantage of a trail already blazed. One such example is one of my all time favorite 80s bands, Duran Duran. A true Duranie would already know that the fab five were heavily influenced by a group called Japan who were a former glam rock band that made the switch to the New Romantic scene in 1980. Japan was formed by Steve and David Batt, two brothers who were heavily influenced by David Bowie and the New York Dolls to the point where they not only copied the musical styles of both Bowie and the Dolls, but actually changed their last names in homage of the Dolls’ key members, Sylvain Sylvain and David Johansen. Steve and David Batt became Steve Jansen and David Sylvian. After a few years they spilt up but by then, their influence on mainstream music in the U.K. was undeniable. One young musician that noticed and followed Japan’s moves was Nick Rhoads. 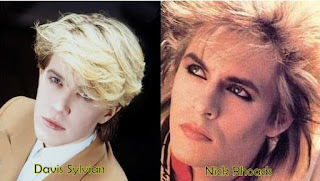 Nick took the best elements of Japan and created Duran Duran. Though Japan’s influence is undeniable, and in some cases blatantly obvious, it seems like an appropriate passing of the torch. Japan created the look and sound and Duran Duran took it to the mainstream and to the next level and beyond.